I debated if I was going to do a review of the year or not like I see other bloggers doing, but then I went back through my archives from January of last year and though ‘Awww, I remember that!’ and decided I was going to give a whirl. First, a short run-down of my ‘word’ from last year and then a post or three from each month that I enjoyed while reviewing my archives. Action was my word for 2013 and beyond March I think I dropped it. In fact, I was thinking my word was prolific but apparently that was my word for 2012. Sooo…I think I’m going to take 2014 off with chosing a word. Out of all the items on my list for Action the first one had the most work. 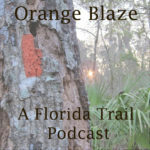 I’m guessing I’m 10-15K words away from the end of my Florida Trail book. When I last left off writing a week ago, we’d just arrived at the motel in Blountstown having just crossed the Apalachicola River and the eastern/central time zone, gaining an extra hour in the day. I think that was about a week and a half out from the end of the trail. Maybe less. No words came up for this year, so I’m just focusing with finishing the bleeping book and peddling it to publishers. We finished the compost bin! I finished the Icelandic turtleneck, which I still have not worn because of the flabby belly I have. If I’d followed up with the last Action item in my list I might have felt comfortable wearing it this year. There was a lot of backyard nature going on. We walked along the beach in Galveston and did a little front seat birding too. We got bees!, enjoyed summer tanagers in the yard, had a mini-flood and a pine tree problem, and I did a little exploration in Lufkin. Watched bats at Old Tunnel State Park, and explored the Upland Island Wilderness of Angelina National Forest. There was a beaver in our backyard! The garden was in a bloom frenzy and we took a trip to Arkansas with family. There was a lot of backyard birding and my grandmother passed away. Hiked Dinosaur Valley State Park with Patrice, Justin, and my dad, the hummingbirds came through, and I did a bit of exploring at a local state forest. We finished the flower garden! Our biggest project of the year. I went for an adventure at a local park, dug sweet potatoes and put the onions in, and had a massive thru-hike fail. We put a For Rent sign up for owls in the neighborhood, and of course there were projects and more projects. It wasn’t nearly the most adventurous year, but we did accomplish a lot around the house, things I didn’t blog about. Here’s to an awesome 2014, y’all! It was a good year. (Except for part :-(.